Whenever I get a craving for something sweet, it’s usually something simple, like a muffin. Even though muffins or bars don’t take that much effort to make, that doesn’t mean that they will somehow be less satisfying. 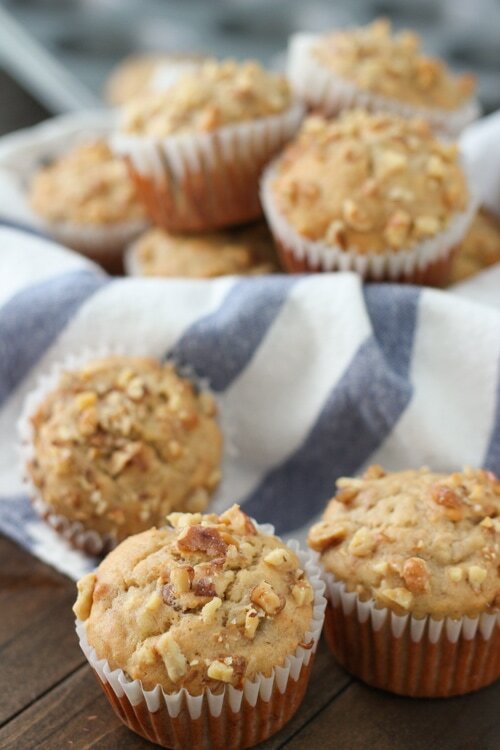 I’ve been looking for a perfect Banana Walnut Muffin recipe for a long time, and I finally came up with the perfect combination of ingredients to end up with a muffin that is moist and tender in the center, not too sweet and of course, really delicious. 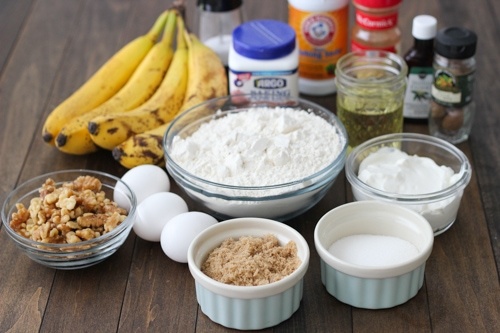 The best part about simple desserts is that the ingredients are very basic and don’t require an extra trip to the store. It’s also a great way to use up bananas that get too ripe. 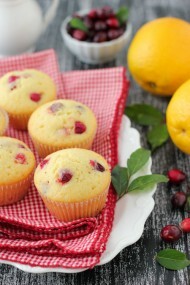 Now that I’m pregnant and have very little appetite, I was thrilled when I made these cupcakes that they actually awakened some of my tastebuds and I just smiled as I bit into the first warm muffin and realized that I finally found the perfect recipe for one of my favorite muffins. Preheat the oven to 375 degrees Fahrenheit. 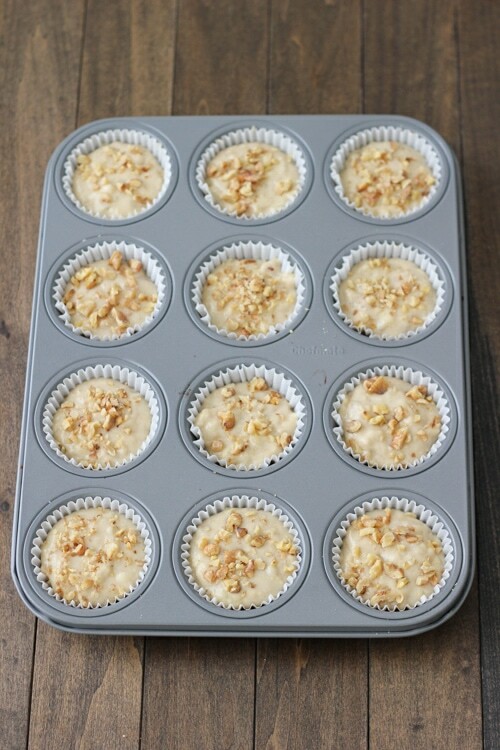 Coat muffin pans with non-stick spray, or use paper liners. 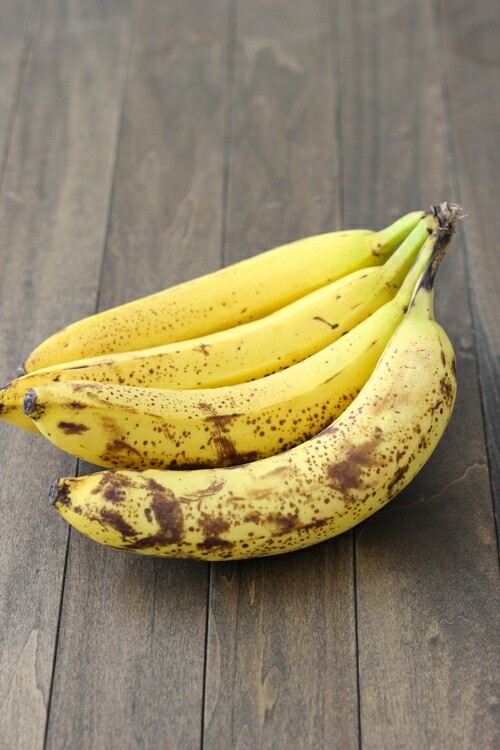 The best bananas to use are the ones that are already really ripe and starting to brown. They are much sweeter and will have a more intense flavor. Mash the bananas. You can get away with using only 3 bananas, if you don’t have 4 available. I like to use a potato masher, but you can use a fork or anything else. 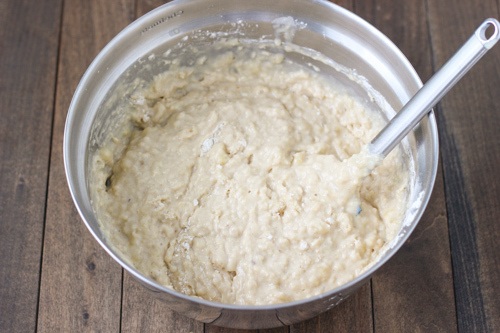 Whisk all the dry ingredients together in a large bowl – the flour, baking powder, baking soda, cinnamon, nutmeg and salt. 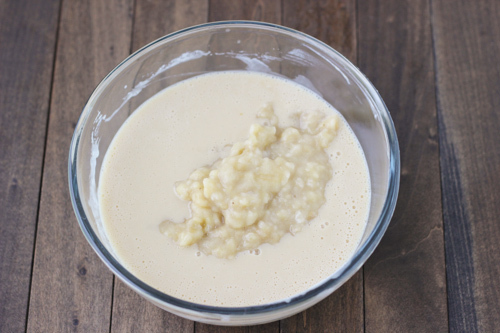 In another bowl, whisk the sugars, eggs, oil, yogurt or sour cream, and vanilla extract. Add the bananas to the liquid ingredients. Make a well in the center of the dry ingredients. Add the liquid ingredients into the well of the dry ingredients. 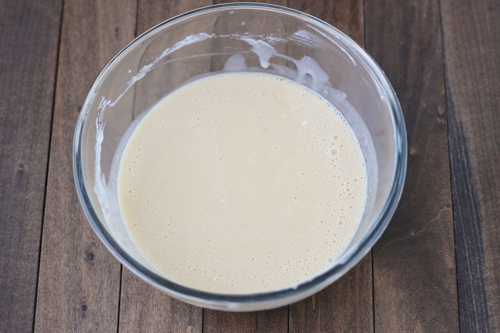 Use a rubber spatula to mix the ingredients together, just until blended. Do NOT over mix. The dough should still be lumpy. It’s normal to see just a few streaks of flour in the batter. Add 1/2 cup of the walnuts to the batter. Mix to combine, gently, trying not to over mix, as I mentioned earlier. Fill the prepared muffin pan with the muffin batter. 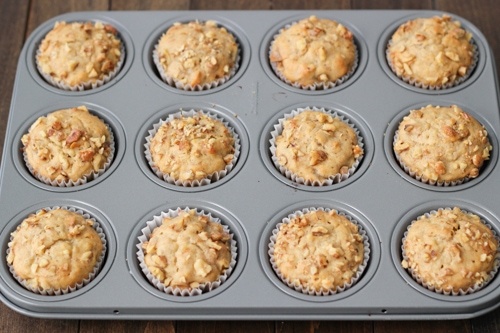 Top the muffins with the remaining walnuts. Of course, you can use any other nuts or omit the nuts completely. You will have 18-24 muffins, depending on how big you want the muffins to be. Bake in the preheated oven for 25-30 minutes. The best bananas to use are the ones that are already really ripe and starting to brown. They are much sweeter and will have a more intense flavor. Mash the bananas. 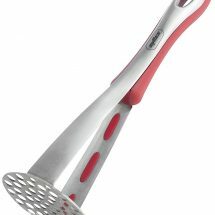 I like to use a potato masher, but you can use a fork or anything else. 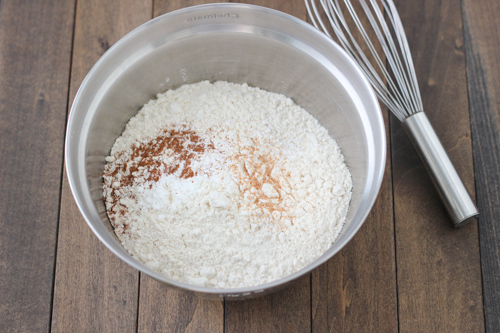 Whisk all the dry ingredients together in a large bowl - the flour, baking powder, baking soda, cinnamon, nutmeg and salt. 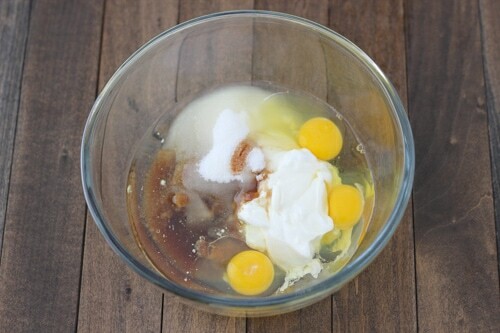 In another bowl, whisk the sugars, eggs, oil, yogurt or sour cream, and vanilla extract. Add the bananas to the liquid ingredients. Make a well in the center of the dry ingredients. Add the liquid ingredients into the well of the dry ingredients. 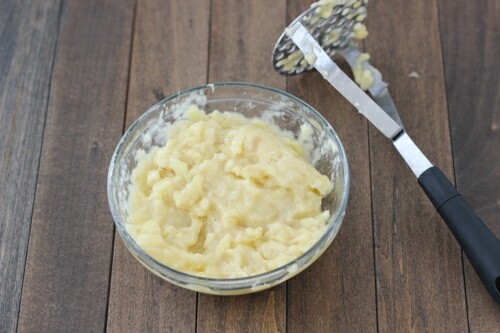 Use a rubber spatula to mix the ingredients together, just until blended. Do NOT over mix. The dough should still be lumpy. It's normal to see just a few streaks of flour in the batter. 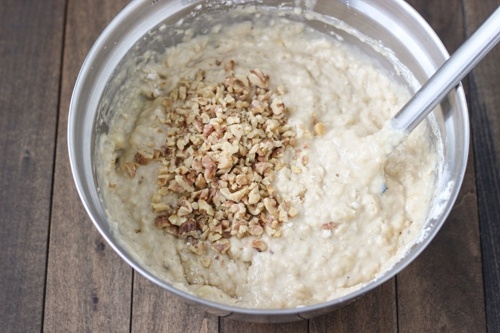 Add ½ cup of the walnuts to the batter. Mix to combine, gently, trying not to over mix, as I mentioned earlier. Fill the prepared muffin pan with the muffin batter. Top the muffins with the remaining walnuts. Of course, you can use any other nuts or omit the nuts completely. You will have 18-24 muffins, depending on how big you want the muffins to be. 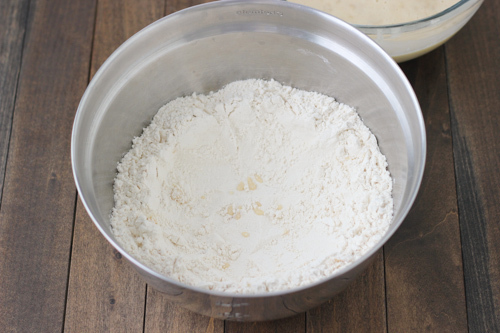 I have a lot of coconut flour and i heard you can substitute regular flour in baking for the coconut flour, but the measurements are different. Do you happen to know how much of coconut flour instead of regular one should i use in this recipe? I really need to use it up in baking and this is a good opportunity…. I’ve never used coconut flour, so I don’t know how to help you, Oksana. Sorry. Wow! That was fast, Lana! I’m so glad you like the muffins. I do think that the sour cream makes them more moist:). These are tasty! I made them last night, and my husband and I enjoyed them…especially when they were warm 🙂 Thanks for sharing the recipe! Can’t wait to try these. I will probably use both sour cream and plain yogurt and just split it between the two. Love banana and nut combination. Thanks olga. Yes, you can definitely freeze these muffins, Jen. Ok, baked these last night with regular flour, as i didn’t have time to look up how to convert the measurement to the amount of coconut flour. I had a friend coming over and wanted to bake something. Anyway, they turned out really good, moist, flavorful ( i also sneaked in some poppy seeds in there, as i have a ton of it and wanted to use). WOW! 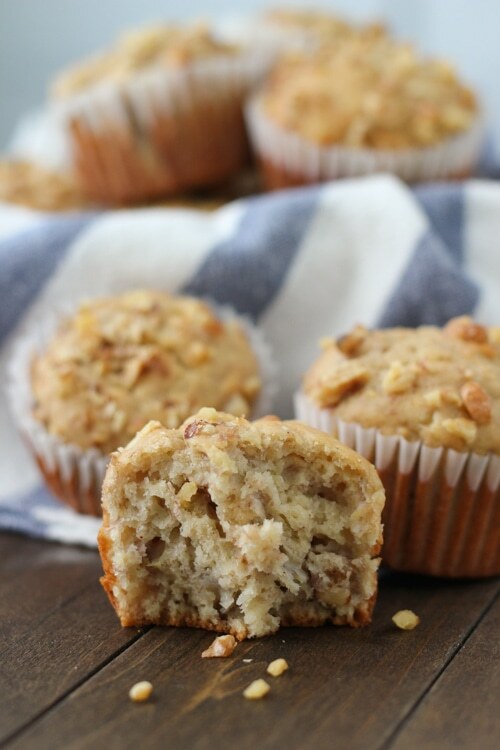 Will never use another recipe ever – this is just pure perfect banana -walnut muffin recipe. 😀 Thank you so much! 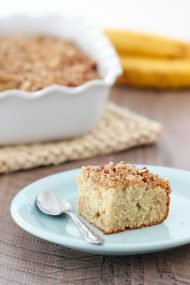 One of my favorite sweets is your banana coffee cake! I bet this will taste great also. Is do have a question I’m pregnant and I can not stand the smell of any oil right now they all stink to me lol I’m worried I’ll smell it in here, any way I can substitute something like butter maybe? And if I can how much? Thank you! Thank you for this wonderful muffins , everyone loved it but they all in one voice demanded for it to be a little bit sweeter . Any suggestions on how much more sugar I can add ? Or maybe substitute part of brown sugar with cane sugar ? That’s really up to you, Liliya. I don’t like desserts to be too sweet, so I tend to use less in my baking. Just add as much as your family prefers. You will have to experiment. Add half a cup more and see what you think. I made these today and they were really good! Thank you! Nice! Chocolate chips and bananas go great together. I have never tried it, so I don’t know, Olga. You will have to experiment. They look so yammy….I want to try this. I have in freezer some bananas, can I use them instead of fresh bananas? Also I have a lot of frozen peaches and I don’t know what to do with them, can you suggest some recipes from your blog, because I love your blog? Absolutely, Ana. Defrost the bananas and discard any liquid. Then use them in the recipe. #1. This smoothie. It’s my absolute favorite. #2. Use peaches instead of plums in this recipe. #4. I also love to make homemade jam from frozen fruit. I don’t have a recipe on my blog, but I just add sugar to taste, a splash of lemon juice and cook it until it reaches the proper consistency. I would like to ask you if I can miss step with brown sugar is it ok? I’m not sure, Natalia. 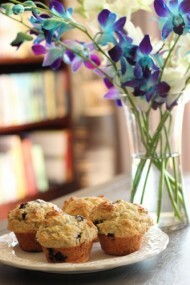 I believe the texture may be different and of course, the muffins will be less sweet. Replacing the butter for the oil will give them a slightly different texture, Tzivia, but the muffins will still turn out just fine.